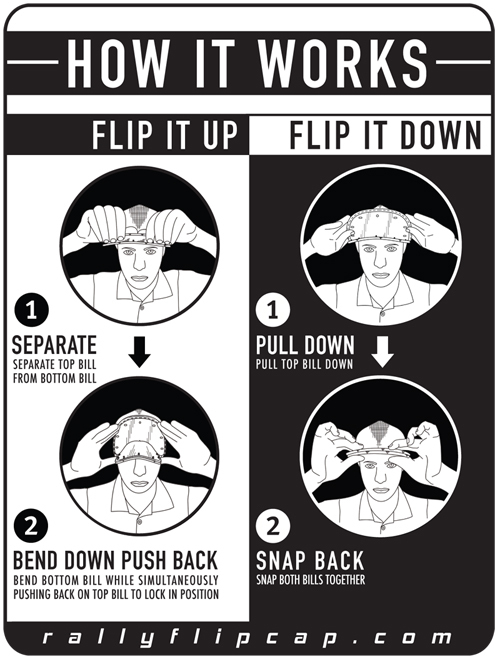 The Rally Flip Cap® is a double billed hat where the user is able to separate the bills in half. The top bill flips up and locks into a 90 degree angle. The Dry Erase Snapback is one version of the RFC which has a dry erase board and comes with a dry erase marker. Our other version, The Classic Snapback, has a printed satin fabric material featuring slogans, phrases, and other creative designs. All of our Rally Flip Caps can be worn and function like a standard baseball cap.